I am finally thinking about back to school and school lunches again. I can’t believe the new school year is starting. Last year my kids FAVORITE school lunch was chicken nuggets. They wanted them all the time and I loved it because it made making school lunches so much easier. However, I felt terrible because their chicken nuggets wouldn’t be warm come lunchtime. 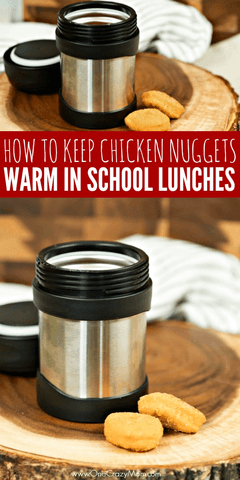 This year we bought small thermos containers for them so not only can they have macaroni and cheese and soups, but they can also keep their chicken nuggets warm. Woohoo! It’s a win all around. Hot lunches are so nice and kids love chicken nuggets! They will be so happy to open their lunch and have warm chicken. School lunches can actually stay warm when you use a thermos. Another tip is to fill the thermos with boiling water. Empty and dry right before filling to keep nuggets warm. 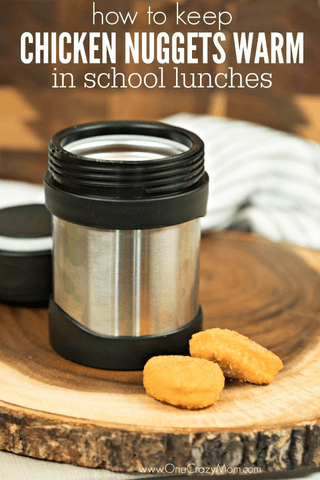 This is so simple and we just love using a thermos for school lunches. You can also learn how to send pizza rolls in school lunches (and keep them warm). 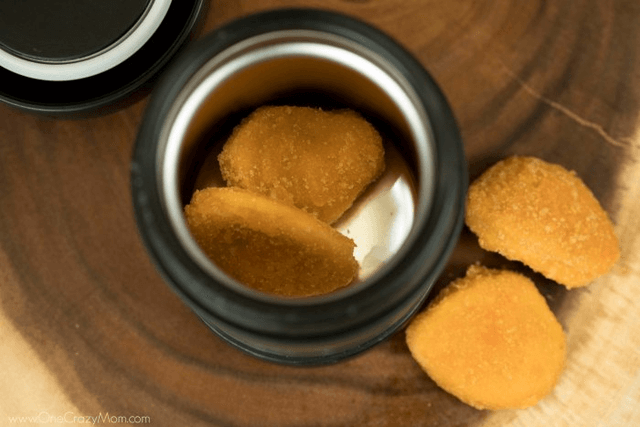 Is it safe to pack chicken nuggets for lunch? Yes! 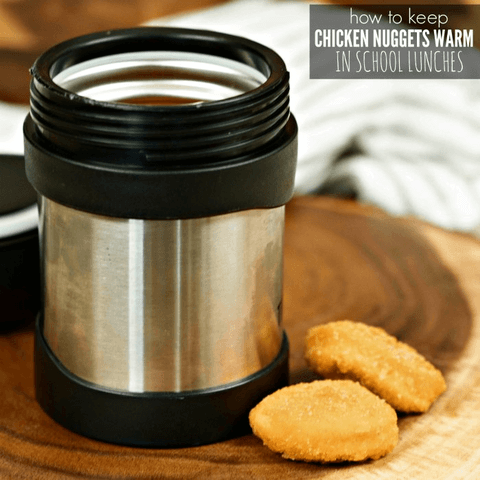 The thermos keeps the chicken nuggets warm and ready to eat at lunch! Your kids will love having this for lunch. It’s the perfect idea to make school lunches a success! Place a paper towel in the bottom of the thermos to absorb the moisture. This will prevent nuggets from getting soggy. It works so well. Now, they can have their favorite lunch and I can feel better knowing my kids will have warm chicken at lunch. Everyone is happy! Give it a try and see how awesome it works. How to keep food warm for hours. 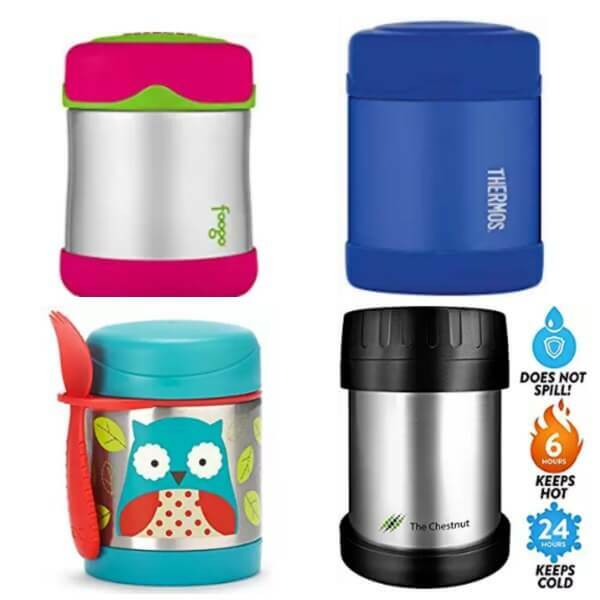 Head on over to Amazon where you will find small thermos containers on sale for as low as $10. Don’t skimp on the thermos. Those plastic ones do not work well. Get a nice thermos on sale and it will last you for years. Trust me! I have learned to buy a good one from the start. It saves me money in the long run. This is the best way to pack chicken nuggets in lunch box! Sandwiches are fine but sometimes the kids just want a hot lunch. Packing chicken nuggets is the perfect solution to boring lunches. Plus, it does not break the bank. Another tip for your hot lunch box. When we have been eating out, we have saved our leftover ketchup packets (because we always get too many) for their lunches. Chick fil A’s are the best. Instead of throwing them away – save them for your next school lunch. No need in those little packets going to waste! If your kids prefer barbecue sauce instead of ketchup, save those packs too. Or maybe they like ranch for their chicken nuggets. Whatever the sauce of choice is, save them when you have extra for school lunches. Now that you know how to keep food warm, school lunches will be a success! Do you have any lunch ideas? Leave a comment and share it with us. We are always looking for new ideas for school. The kids are so happy I learned how to pack frozen chicken nuggets for lunch! It’s a nice change from sandwiches. You might also like these 30 back to school breakfast ideas and 25 After School Snacks for Kids. There are lots of great idea to use during the busy school year. These ideas are easy and don’t take a ton of time. They also are budget friendly. Perfect to have a great school year! Lunch time will be a hit! The kids will be happy and you will be happy knowing they had a good lunch. While we are talking about school, try these 15 DIY back to school organization ideas. Keep everything organized and decrease clutter with these fun ideas. This school year is sure to be a big success with so many awesome tips to make the year great! Get the year started off right. It will set the tone for the entire school year. Things just run smoother when you have a game plan. It’s so nice to have everything organized. I love having simple ideas for school I can rely on during the year. Learn how to send Pizza rolls in School Lunches. This simple tip will make packing lunches a breeze. It’s quick and easy! Are your kids tired of sandwiches every day? Try these 20 Non Sandwich Lunch Ideas for Kids that they will love! Quick Lunch Idea for Kids – Cookie Cutter Sandwich! How to Customize your Kids Lunch with Edible Markers! How long do you think it is safe for them to stay in the thermos before the threat of food poisoning? I do this already but I boil some water in a teapot, then pour it into the thermos and let it sit in there for 10 mins with lid on. As soon as I finish cooking the nuggets in the toaster oven, I empty the water from the thermos and dry it out thouroughly with a towel. With the internal part of the thermos now very hot, it helps maintain heat until lunchtime. 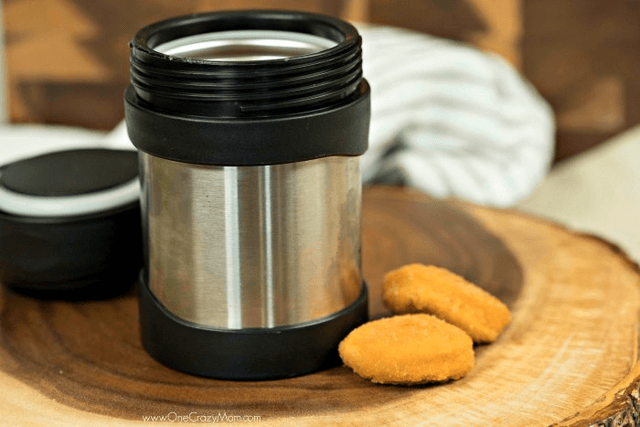 How long do you cook the chicken nuggets for prior to pouring them in the thermos? You boil water. Cook chicken nuggets per instructions on package. Pour water in thermos while nuggets are cooking and let sit. When chicken is ready dry thermos. Add folded paper towel to bottom to absorb moisture so nuggets dont get soggy and seal lid. I always cook some French fries and popcorn chicken or mini corn dogs.